Project Budget 4×4 – HubNut – celebrating the average! 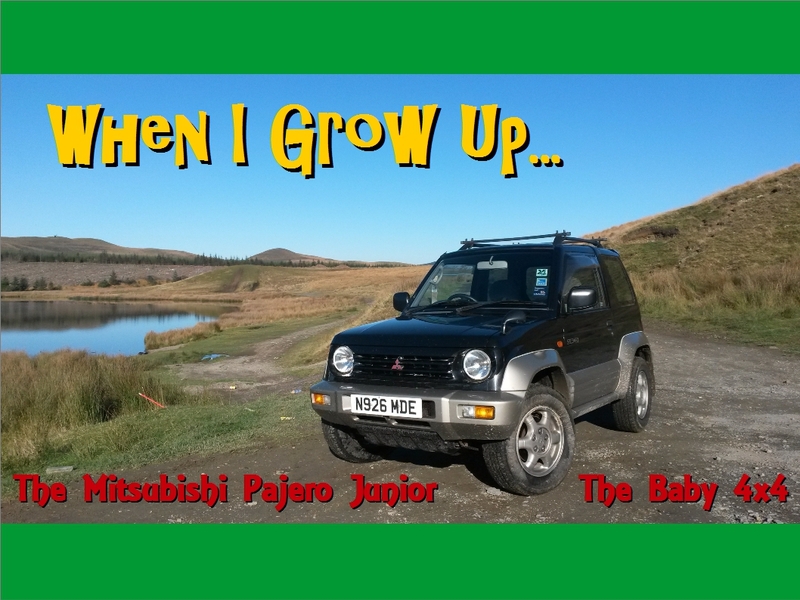 I love small cars, and 4x4s don’t get much smaller, or cuter, than the Mitsubishi Pajero Junior. Well, ok. There’s the Pajero Mini as well. Full details below! The test features on and off-road antics. Another dream achieved. Baby 4×4! I’m particularly thrilled with this one, as I love 4x4s that have proper 4×4 functions. This is not a mere city car with chunky looks. The Pajero Junior was never officially sold in the UK, but many of the 70,000+ built were imported. It was replaced in 1998 by the Pajero Pinin – sold as the Shogun Pinin in Europe the UK, and built by Pininfarina. 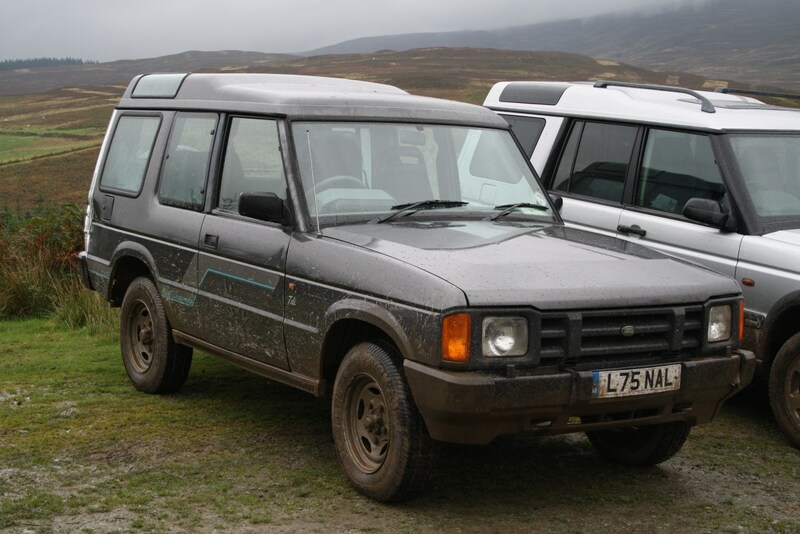 That’s also a 4×4 with very genuine ‘rough stuff’ ability. While I’ve been healing, I’ve done very little driving in the Discovery. But good news – my thumb is much better! I can now drive all of my cars again and, as I discovered this afternoon, I can work on them again too! 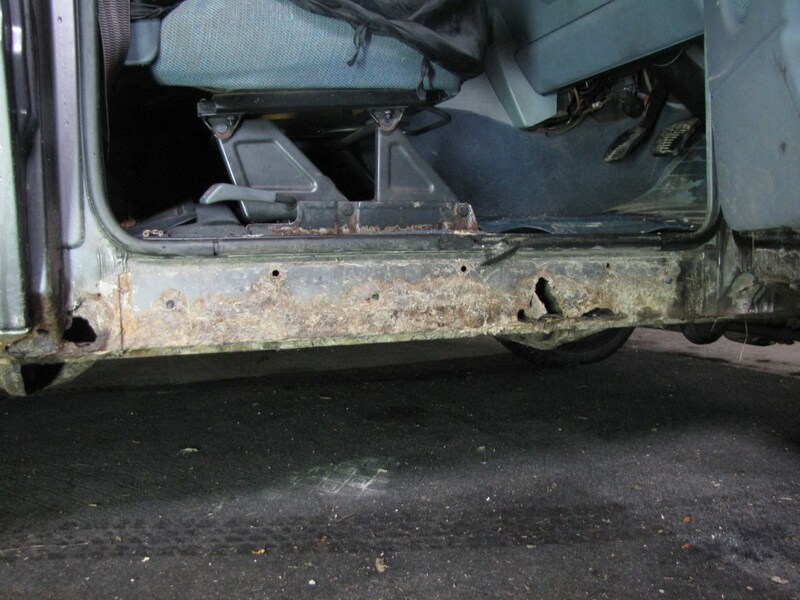 The Discovery was lucky to get through the MOT due to sill corrosion. 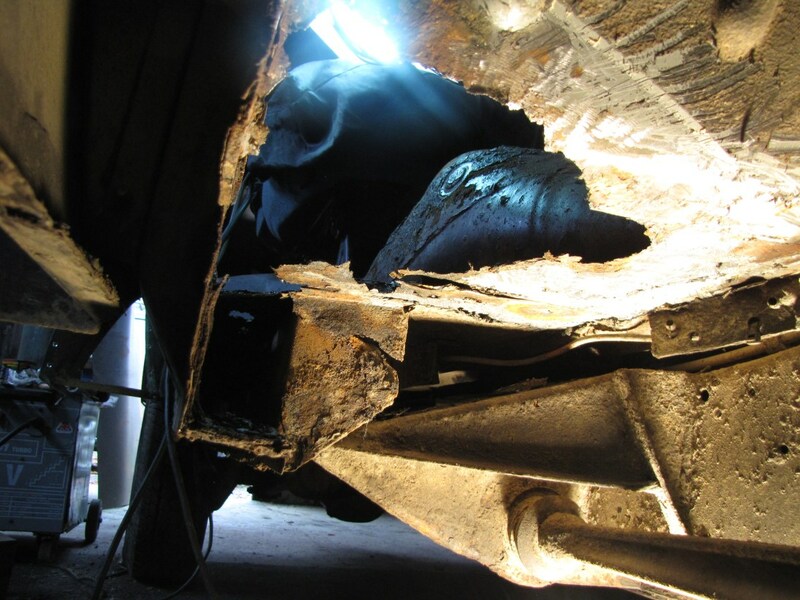 It was an advisory item because most of the rot was hidden by a sill cover, which the MOT tester is not allowed to remove. Me and my mate Dave are fully qualified though, so we pulled off the trim. As you can see, it was properly rotten. Thankfully, rot seemed to be confined to the outer sill – the inner generally seemed sound. Gaining further access to the sill isn’t easy. 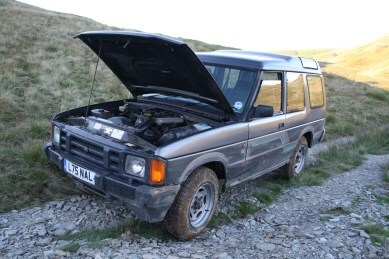 A Discovery 3-door becomes a real challenge if you need to replace the sills. 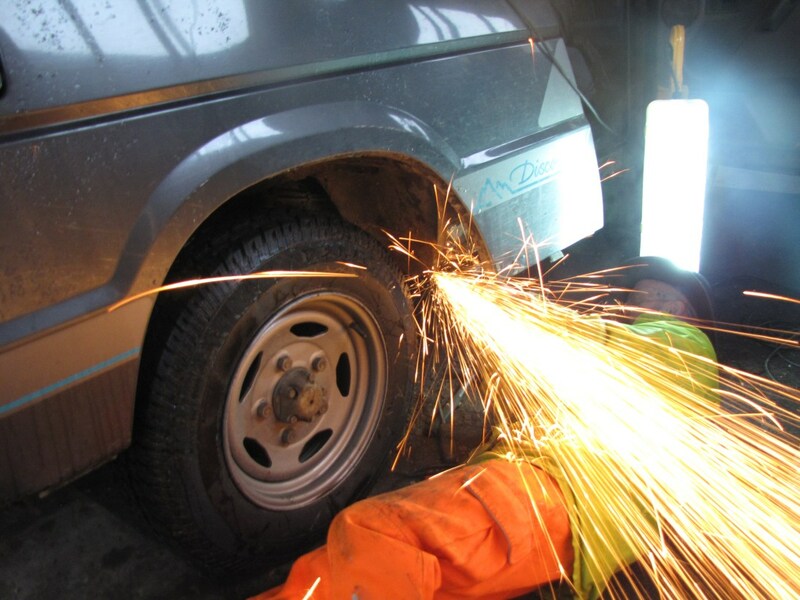 A common bodge is to just cut the lower bodywork. That’s a clumsy way to do it. 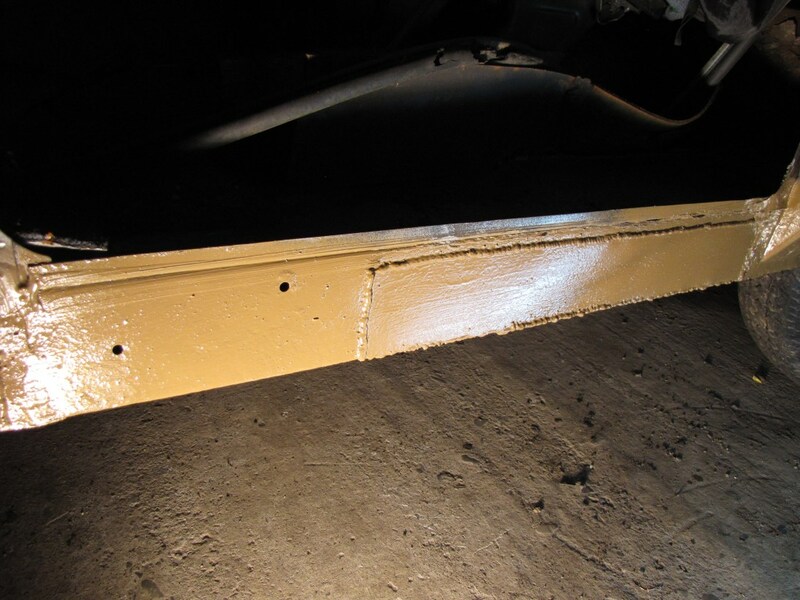 We opted to drill out the spot welds holding the outer panel in place, which allowed us to wedge it out of the way. Naturally, things were a bit grim behind there, but not as bad as they could be. There’s an inner skin of steel, which had started to corrode. This is because road muck from the rear wheels gets forced into the cavity, but it’s impossible to clean it out, so rot can merrily start. Further surgery was required though. It was time for power tools. The key to a good repair job is to get rid of as much rusty panelwork as you can. You must find good metal – there’s no point leaving rusty stuff as it’ll just make your new repair fall apart. As we dug and dug our way in, I had to start stripping the interior out to prevent it catching fire during grinding/welding. By the time I had to leave, my mate Dave had got to this stage. More of the inner sill needed removing that we first thought, but that’s the nature of rot-busting. Once all the rot is gone, Dave can get on with fabricating repair sections in nice, thick steel. I was tempted both by complete replacement sills and the idea of fitting seriously beefed up ones. I’ve decided I prefer Dave’s fabricated approach though, which will use good metal, only replace what needs replacing and by the time we’ve finished, will hopefully leave it looking pretty much stock. I’ve decided that I don’t want a monster truck. The closer this vehicle remains to factory, the better. You could be forgiven for thinking I only currently have eyes for oddball Japanese city cars at the moment, for I seem to have been truly captivated by the Sirion. But there are other vehicles on the ClassicHub fleet, and I still like those too. The Discovery continues to provide sterling service and is steadily improving as I get on top of its lengthy To Do list. I can’t really describe why I love the Disco so much, but it gives off vibes that just make me happy. This weekend just gone, I headed northwards for my second session of off-roading at Landcraft. I’d visited the site back in August, and a report of that has just been published in the December 2013 issue of 4×4 Magazine. Thing is, I enjoyed it so much that I just had to return! 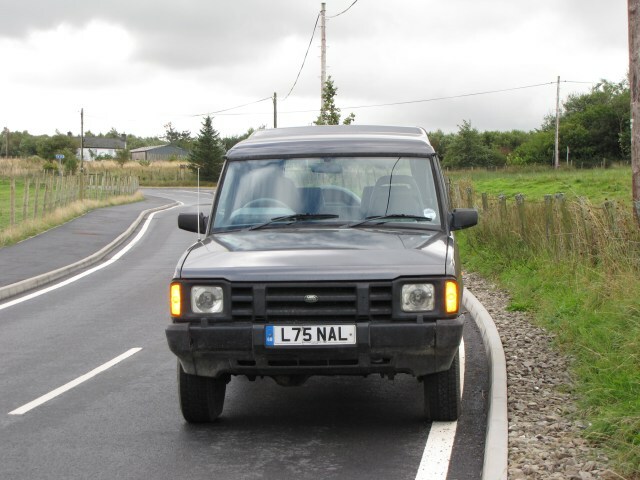 As I tackled the many bends between our house and Bala, I must say that the Discovery feels very odd to drive after 250 miles in a small, Japanese hatchback. The Disco is heavier to drive, and slightly cumbersome, but still eats the miles effortlessly, with the rev counter rarely rising about 2500rpm – stark contrast to the frenetic three-pot in the Daihatsu. Once there, I had a splendid time once more. 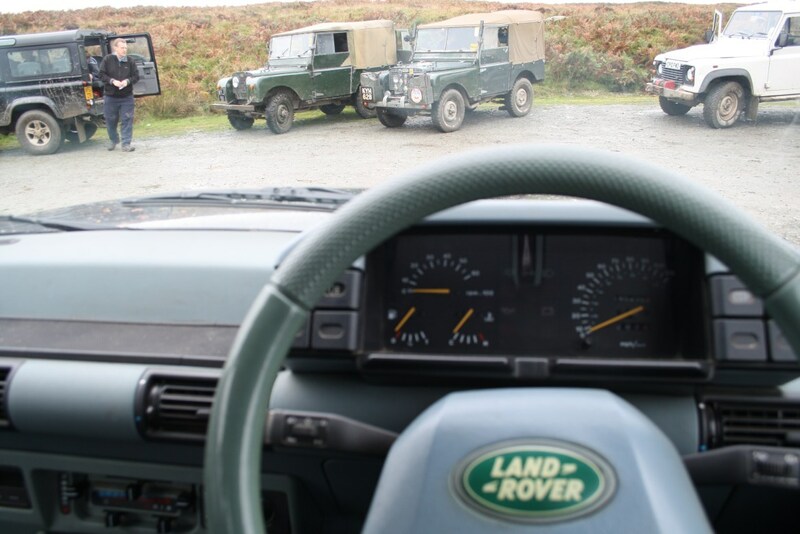 We were joined by Land Rovers of many eras, from a very early Series 1 to a Discovery 3, with all its many electronic aids. The Series 1s looked more fun! Again, my Discovery coped well. Its lack of modifications or aggresive rubber mean line choice and momentum are absolute critical. It’s a very good work out for car and driver. In many ways, much of the technology of the Series 1 is still evident on my Discovery. It has similar beam axles (albeit with a change of suspension spring), a similar ladder-frame chassis and fairly simple aluminium bodywork. Both wear skinny tyres too, and traction was certainly an issue at times, for ancient and less-old alike. That’s all part of the fun really. The Discovery 3 seemed to just amble around the course without fluster. It didn’t look half as much fun! 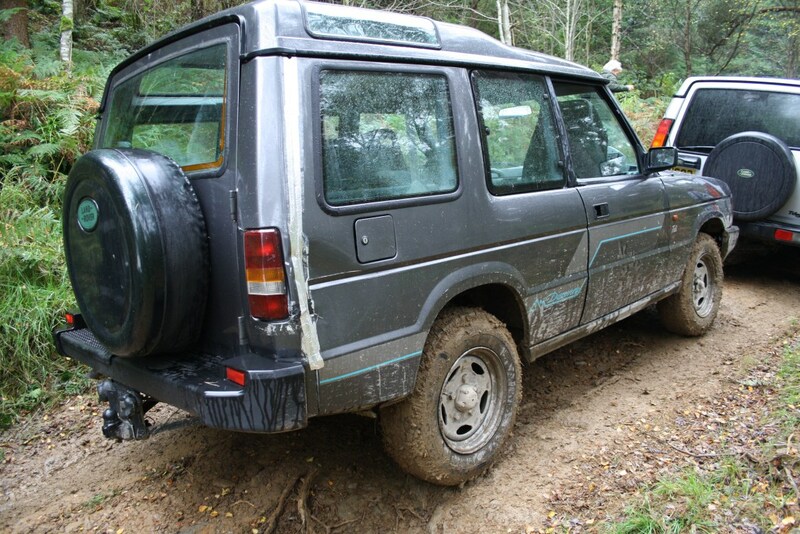 The Disco’s towbar took a few knocks, but damage was otherwise only notable by its absence. That’s what I like about Landcraft – it’s designed to be fun but these Adventure Days are gentle enough to easily avoid damage. I’d quite like to tackle one of the Adventure Plus days, but that brings me back to the main problem of recovery points. On the Plus days, it sounds like getting stuck is very possible – though it’s something I always try my utmost to avoid. The Discovery has no front recovery points though, and I’m struggling to find a way to fit any that doesn’t compromise the factory looks. Perhaps I’m going to have to admit defeat and fit a stronger Heavy Duty bumper. It’s a dilemma for me. I love off-roading in stock vehicles and prefer the lack of on-road compromise that results from it. I don’t want to make my off-roader look butch and menacing. Sadly, if I want to enjoy myself more, it looks like modification is the only way. Here’s a video of Sunday’s exploits as I have to carefully manage the throttle to avoid wheelspin while still keeping up enough momentum! It’s quite easy to get a bit blasé about greenlaning. I’ve been doing it for years, and have been proud of the fact that I’ve never got stuck and have generally avoided any damage to my car at all. That changed last night. We were tackling a tricky lane in Nant-y-Moch, one which will be closed in a few days time for tree felling. Me and a friend thought we’d get in before the chop so to speak. It’s a lane we both know well, and one which I’ve travelled down twice in the past couple of months, with no drama at all. Going up the lane is much more difficult, but I’d successfully done so in the Maverick last year, albeit it was very much a challenge that required several attempts. I got through what I thought was the tricky section with no problems. Easy! It’s all about momentum – going as slowly as possible, but quickly enough to keep moving. Then the lane began to tilt the Discovery onto its side. One side of the lane had been washed out very badly, and I mis-judged just how bad things were. The front end began to slide into the bank and the rear followed. I eased back and forth, but there was no escape. I was lodged firmly against the bank. My options were to attempt recovery or risk much damage. With the front indicator housing already snapped off its mountings, recovery seemed the sensible option. I could drive forward to free the front end from the bank, but was powerless to do the same with the rear. My friend in his Defender was deployed and a short, sharp tug pulled the back end away. I could then reverse down the lane to ponder our next move and repair damage! We used string to hold the indicator housing in place. I think superglue should mend it longer term. That wasn’t the only damage though. The entire side is now littered with scratch marks, some of them quite deep. 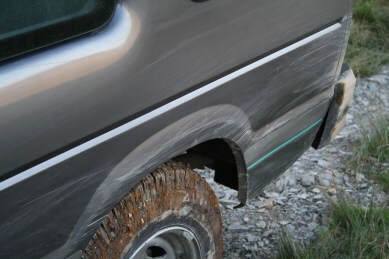 Fortunately, the Discovery’s side panels are aluminium, so corrosion is not a problem. I’ll have to see what I can do about tidying it up a bit. My friend then set about getting even more stuck than I had managed, so the rest of our adventure involved trying to free his Defender – a fine education in how to use a hi-lift jack and the importance of having a shovel. With his car free and light fading, we opted to abort our adventure. We’d got all of about half a mile into the lane! Our local laning group is already plotting repairs to this lane, so hopefully when it reopens in 2014, it’ll be in far better shape. But for me, I’m now rethinking the future of the Discovery. My initial plan was one of preservation, keeping the Disco as original as possible. Now I’ve damaged it and also realised how poor a standard Discovery is when it comes to recovery points, I’m considering a change of direction. Is it time to make with the modifications? Do I really want a vehicle that looks more aggressive? It’s perhaps time to answer those questions. As described earlier, my plan to drive to North Yorkshire in the Discovery only last three miles. I think it probably goes down as one of my least successful journeys ever. A bang, a clatter and then the front nearside wheel locked up. Fortunately for me, it was wet and the front wheel happened to be on a white line at the time, so the retardation effect was not too dramatic. Enough for me to know that my destination was well out of reach though. I nervously limped home at 20mph (the hazard lights got a lot of use that day), not daring to go any faster because of the hideous noise coming from the front end. Knowledgeable people reckoned it was likely to be a failed wheel bearing and the grumbling noise certainly seemed to back that up. Yesterday, I limped to my mate Dave’s house, where we pulled the front hub apart. The outer bearing looked fine, but when the pulled the hub off, the inner bearing simply fell out in many pieces. 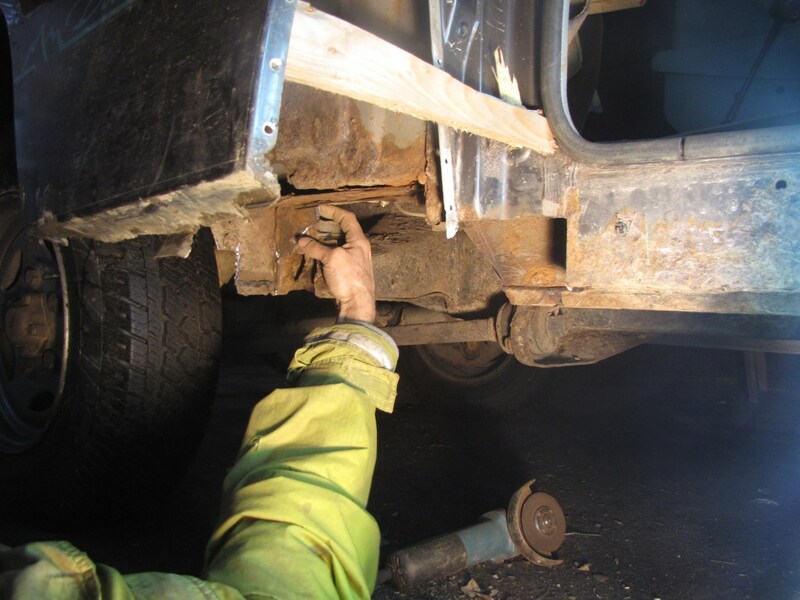 It was absolutely bone dry and the failure had been sufficient to turn the inner collar on the axle shaft – that takes some force. It took some force to remove it too, but happily, with plenty of grease and a fair degree of effort, the new bearings were soon in place. What a transformation. The bump-shake tendency when hitting a pothole with the nearside front wheel has gone entirely and it all seems a lot quieter too. That’s the thing with permanent four-wheel drive – there are an awful lot of moving parts, and it becomes difficult to hear one over any other. I certainly noticed the difference once the duff bearing was gone though! I’ll hopefully be putting it immediately to the test as the plan is to go greenlaning in Gloucestershire this weekend. 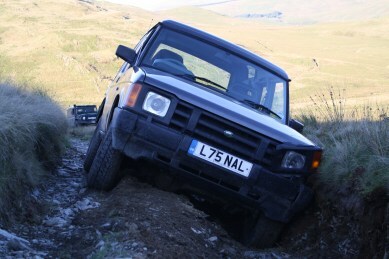 Hopefully it’ll make up for the lack of Disco laning last weekend – fun as it was. I didn’t buy the Disco so I could go laning in someone else’s vehicle. It has been interesting to find that I’ve now clocked up 1200 miles in the Discovery, even though it stayed at home last weekend. That’s in just over three months of ownership – IIRC I only managed 1500 miles in eight months with the Ford Maverick. The improved economy of the Discovery is certainly a factor – 27mpg compared to 20-22 – but the Disco is much more comfortable as well, and I find it much nicer to drive on the roads. Certainly, this is one vehicle I remain very happy about buying.